I don’t think it really matters who is going to take over this team. And I’m starting to think that it won’t matter who is going to play for it, in the next few years. We’ve reached a point where the ability of the coach and the players’ skill stopped counting. They’d come handy, no doubt, but they won’t suffice. Not anymore. And we should stop looking for the Hagi that can score wonderful goals and start searching for the guys that feel the same way Gica used to feel when wearing the national team’s outfit. Or Dorinel Munteanu, currently teaching some anonymous football players from Otelul Galati that the matches and the league titles can be won through hard, honest work. Or Gica Popescu, the man who knew that he could help Romanian football only by taking the the Romanian Football Federation’s head. 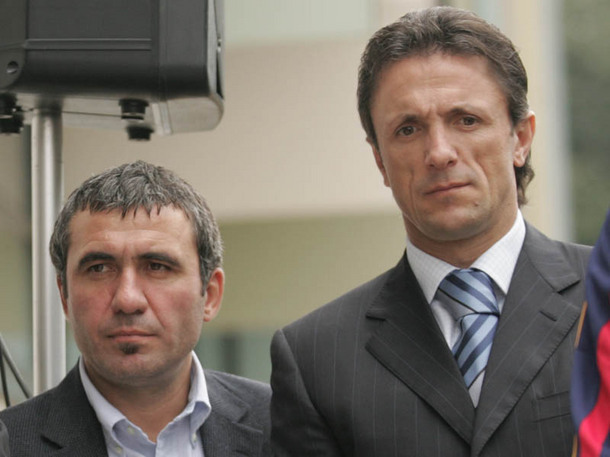 Obviously, the sick body answered back at any attempt to inject some health: Hagi was destroyed as a man and a coach through the media hungry for any bad word that came out of Gigi Becali’s big mouth, Munteanu was labelled as a match fixer, after his first experiences as a coach, while Popescu was humiliated by a dirty voting system, controlled by Sandu, the man who definitely deserves his nickname: “The Godfather”. What happened after the game versus Bosnia is hard to explain by anyone who has some common sense and can think beyond himself. After some harsh and, at times, undeserved criticism, lead by the other Becalis, Victor and “Giovani”, Razvan Lucescu slapped everyone in the face with the surprising 3-0 win and resigned, agreeing immediately to take over Rapid, making no effort to make this look like a random series of events. Mircea Lucescu’s son had been planning this for a while, though, that’s why he called FC Brasov’s Cristian Oros for the first time to the national team. The centre-back was a 26 years old who is going to play for… Rapid next season. An accident? Steaua’s Romeo Surdu (27) also earned a call-up and he will also switch teams this summer, going from Steaua to Lucescu’s next club. But this was nothing. The real blow was Lucescu’s refusal to go with the team he had selected and to the South American tournament he had asked for, one that included an extremely important game: Romania needed a win against Paraguay. Any other result would have relegated us to the fourth pot ahead of the draw for the qualifying groups to World Cup 2014, but nobody gave a damn. From the head of the Federation to the players that “love to play for the national team”. Mircea Sandu, the chief, Ionut Lupescu, the executive president, Razvan Lucescu, the quitter, plus “the stars” Adrian Mutu, Cristian Sapunaru, Gabriel Tamas and Razvan Rat, who didn’t put the respect for the national team above their apetite for partying during the summer, simply refused to travel to South America! For us, Romanians, who watched in disbelief the 0-2 defeat against Paraguay, this shouldn’t be remembered as the tournament that saw Ronaldo play his last game for Brazil. It should be the marked as the moment when all those who could have brought back to life the national team decided to pull the plug. Victor Piturca’s third spell at the national team starts now. Should we (re)start hoping? Steaua had three options. Obviously, went for the fourth: Ronny Levy is the new coach!